As the Land of the Rising Sun was always high on my bucket list, planning a trip there was nothing short of amazing. Magnificent temples, beautiful gardens, exquisite cuisine – all of those were crossed off the list as soon as I arrived to Tokyo. However, I still had one important thing to do – dress up as a Geisha. Knowing that Kyoto was the city where the first official Geisha were licensed, the decision was made quickly. Extensive research, a few e-mails and I had the best place in town – Aya Geisha Makeover. To all of those who don’t know, Geisha are traditional Japanese female entertainers. Their skills include tea pouring at ceremonies, flower arranging, calligraphy, playing the shamisan, dancing and conversation. Due to a few unfortunate twists of fate, Geishas have often been wrongly characterized as prostitutes, where in reality – they are as far from prostitution as it gets. The training for a Geisha is nowadays extremely rigorous and very few decide to choose this path, although the tradition still lives in Japan. The day of the makeover, I was told to come wearing no make up. Excited and interested in the attire and the whole look in general, I entered the little studio. It was decided I would be a Maiko, a Geisha apprentice. After my face was painted by the skillful make- up artist, it was time to do my hair. As Maiko hair is done with natural hair, my long locks were intertwined with the wig. Having hair and make up done, it was time for the kimono. The staff kindly offered me a wide selection to choose from, later probably questioning my choice, as I wanted to be as colorful as possible. After layers of clothes were on me and both my obi and obi belt were keeping me tight in my kimono, I was ready. Even though walking in my okobo sandals was not an easy task, I managed a short walk in the garden. Looking back at my trip, I can say I truly cherish this experience and the opportunity I was given. 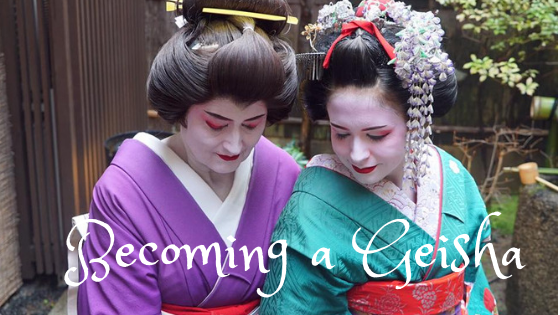 There is really no better way to appreciate a nation than immersing yourself into the local culture and if becoming a Geisha wasn’t on top of your ‘Things to do in Japan’ list, put it on it.